A meeting of unaffiliated Members of Parliament under the theme "Development of pipeline transport as protection of economic interests of Ukraine and control of foreign trade" took place in Kyiv on July 18. Among participants were MPs, in particular members of the Energy and Fuel Committee, Nuclear Policy and Safety, representatives of law enforcement agencies, State Fiscal Office of Ukraine, relevant institutions, Naftogaz of Ukraine and Ukrtransgaz. In the Ukrtransgaz’ representative report about the long-term unauthorized gas withdrawal from the Ukraine gas transmission system by the gas distribution operators was underlined that it have been resulted to a critical growth of the accumulated debts. Starting from 2016 debts are continuingly growing and as of 30 of June 2018, it reached the UAH 25 bln (almost USD 1 bln). Now, this systemic problem has not yet been resolved. Participant agreed that in a current situation Ukraine’s energy security put at risk, and therefore it requires immediate and comprehensive solution involving authorities of all levels. The launch of the work group can be a first step of the effective resolution. The group must include Energy Community Secretariat, the Parliamentary Committee on Fuel and Energy Complex, Nuclear Policy and Safety, the Ministry of Energy, the National Commission for state regulation in the energy and utilities (NKREKP), Ukrtransgaz, gas network distribution operators and experts. The work group goal is to analyze the new Code edition in order to determine "black holes" of the document that require immediate removal and to develop a list of all necessary changes to the current regulatory framework that would make impossible to carry out any illegal actions at this market. The most appropriate solution for the Ukrainian GTS will be the adoption of the EU standards. The situation with critical accumulated debts of the private gas distribution companies have aroused due to the fact NKREKP, as an independent industry regulator defined by the Law of Ukraine, ignored the legitimate right of the GTS operator to develop the Code and thus violated the norms of the Law of Ukraine “On the Natural Gas Market". The new version of the GTS Code, developed and adopted by the NKREKP, not only does not comply with European energy legislation, but also has significant risks for both the GTS operator and the existence of the gas market as a whole. Ukrtransgaz has repeatedly stated that the latest changes to the GTS Code, the new version of which are going to come into force on August 1 by the NKREKP Resolution No. 1437 of December 27, 2017, will not allow a transition to a transparent, open and competitive gas market. During the last 9 months, Ukrtransgaz sent 10 letters to the NKREKP with comments, but, unfortunately, there was no meaningful dialogue with the Regulator. In addition, the new wording of the Code was adopted with violation of the procedure for the development and approval of amendments, including in violation of the requirements of the Law of Ukraine "On the Natural Gas Market". As a result, Ukrtransgaz was forced to file a lawsuit against NKRECP, as the existing observations are critical to ensuring the smooth operation of the Ukrainian GTS. Although the NERCP claims they have agreed a new version of the GTS Code with the Energy Community, this not responds to reality. The Community Secretariat has repeatedly drawn the attention of the NKRECP to bring all amendments and proposals in line with the GTS Code (see the letter of the Energy Community Secretariat dated November 3, 2017 and the letter from the Energy Community Secretariat to NERCP of November 15, 2017). 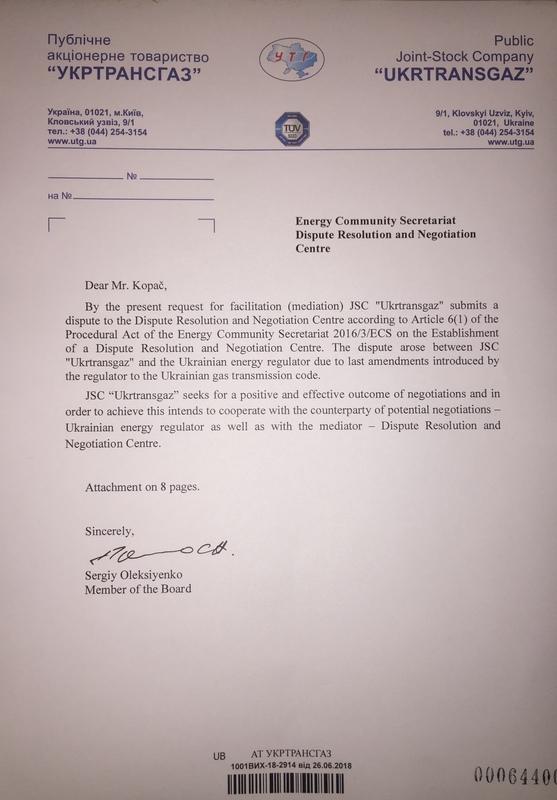 After the consideration of all threats and risks, Ukrtransgaz appealed to the Dispute Settlement and Mediation Center at the Energy Community Secretariat to mediate with the NKRECP in order to bring the GTS Code in line with the norms and practices of the EU natural gas market (see the letter Ukrtransgaz to the Secretariat of the Energy Community from 06/26/2018). On July 11, the first meeting of the representative of the Secretariat, Ukrtransgaz and the NKRECP took place as the first stage of mediation process to bring the Code of the gas transmission system to the norms of the European energy legislation. The parties outlined their positions, which allowed them to find a number of common points and agreed on the preparation of changes based on the agreements reached. The next session with the Energy Community mediator will take place on July 25.